Sand Island Outfall Ultraviolet Disinfection Study | Sea Engineering, Inc. In response to the requirement of a NPDES modified 301(h) permit issued to the Sand Island Wastewater Treatment Plant (SIWWTP) the City & County of Honolulu began the ultraviolet disinfection of sewage in December of 2006. Sea Engineering was contracted to investigate the effects on nearshore water quality of the UV disinfection. Work included developing, in conjunction with the University of Hawaii, a statistical method to determine the effects of UV disinfection on the bacteriological levels in the Mamala Bay receiving waters. Once a method was selected, bacteriological data collected by the City from 2001 through 2006 was re-analyzed. The same analysis was then used to analyze the City data collected during the first year of the UV disinfection study. 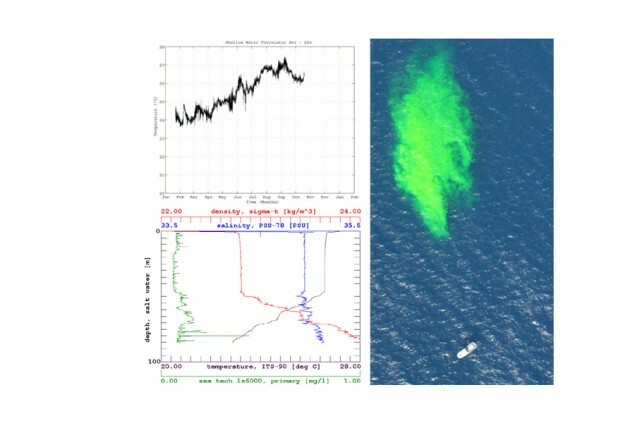 Associated oceanographic work included two year-long in-situ measurements of currents and density at two stations, one at the diffuser site in 240 feet of water and one offshore in 1000 feet of water. The current meter, temperature data and eddy diffusivity coefficient collected during the field measurements were used to model the nearfield plume dynamics and compared to field measurements. Finding of the ultraviolet disinfection study were presented to the City & County of Honolulu and the Environmental Protection Agency.